Give someone you love the harvest from a cocoa tree. Hernando Cortes discovered the bitter drink (xocolatl) used by the Aztecs and sent the beans and recipes back to King Charles V. The Spanish refined the recipe adding sugar and heating the ingredients to improve the taste. By the end of the 18th century, Mexican chocolate had become an addiction among the Spanish elite and a cause of grave moral concern. As we all know, chocolate comes from the seeds or beans of the cacao tree. Fresh from the pod, the bean has a strong, bitter taste. The process of turning it into the delicacy we know as chocolate begins in the rain forests of Costa Rica where the workers use a curved knife at the end of a long pole to clip the pods from the tree–leaving the pods on the ground where they are shelled and heaped into piles to “sweat” or ferment for several days. This process removes the pulp and brings about chemical changes. Once they are dried, the almond shaped beans take on their rich brown color and are bagged for shipment. At the factory, they are poured into large roasting machines that develop the flavor and dry the thin husks. The beans are then crushed between steel rollers, and the husks fall off easily. Fanning and sifting separate the husks, the germ of the seed, and the cocoa nibs as the core of the bean is called. The husks are often used as fertilizer or ground up for cattle feed. The nibs are the essential part used in making chocolate products. They (the nibs) are now ground between successive sets of granite stones or steel rollers. The friction melts the fat in the beans and reduces the solids to powder. The result is a smooth, dark brown liquid that will either be used to create cocoa or baking chocolate. If it is cocoa, the liquid is compressed in hydraulic presses that squeeze out the cocoa butter, as the fat is called. The resulting cakes, lighter brown in color, are then ground, sifted, and packaged as cocoa. The yellowish cocoa butter is cooled in bars and sold to cosmetics makers. In turning the cocoa into baking chocolate, the liquid chocolate is further refined in grinding machines called conches or longitudinals. A granite roller passes back and forth over a flat stone that grinds for four days and nights! Finally, the chocolate is poured into molds and becomes “bitter chocolate” for baking. Members of our rural cooperative grow strictly organic, single-origin cocoa of the criollo variety. It is called the Prince of Cocoa because of its very high quality grade and exceptional aroma and flavor. Less than 15 per cent of the world’s cocoa is criollo grown mainly in Central America and the Caribbean. 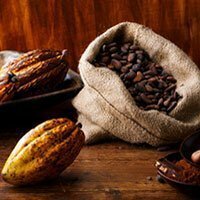 The most common cocoa variety that accounts for 90 per cent of cocoa beans produced in the world is forastero, grown mainly in Brazil and Africa. It is hardier, higher yielding and easier to cultivate than criollo, and is used in just about every blend of chocolate that is produced. The cross between strains of the other two types is called trinitario. As you may be able to tell by the name, it was first grown in Trinidad. For thousands of years, beginning with the Olmecs of Central America circa 2000-500 BC and later with the Mayans and the Aztecs, cacao beans were used to make a grainy, fatty drink that was highly valued for its ability to conquer fatigue and improve brain power. For the Aztec emperor Montezuma, the foaming quantities of xocolatl (literally, bitter water) were an early version of Viagra. The beans were also imbued with a spiritual significance, and also used as money. The ancient Mayans celebrated an annual festival in April to honor their cacao god, Ek Chuah, an event that included offerings of cacao, feathers, and incense, and an exchange of gifts.